Rivaroxaban is a direct inhibitor of Factor Xa with Ki and IC50 of 0.4 nM and 0.7 nM in cell-free assays, respectively. It is selective for human factor Xa, for which it has >10 000-fold greater selectivity than for other biologically relevant serine proteases (IC50 >20 μM). a, BMDMs were pretreated with or without 10 μM FXa inhibitor rivaroxaban or 10 μM DPP4 inhibitor KR62436, followed by incubation for 4 h with rFX or rDPP4 alone or in combination. Mcp1 mRNA was then quantified. n = 4 technical replicates per group; mean ± s.e.m. ; *P < 0.05 by one-way ANOVA. Nature, 2018, 555(7698):673-677. Rivaroxaban purchased from Selleck. a) Correlation between rivaroxaban trough plasma concentrations measured by liquid chromatography-tandem mass spectrometry (LC-MS/MS) and concentrations indirectly estimated by the rivaroxaban anti-FXa activity assay for all samples (15 and 20 mg OD, n = 71). The regression line is added. Eur J Clin Pharmacol, 2016, 72(6):671-9 . Rivaroxaban purchased from Selleck. In vivo, scatter plot of PT (a)、PT ratio(b)、APTT(c) and APTT ratio(d) versus rivaroxaban concentrations measured by Biophen DiXaI. 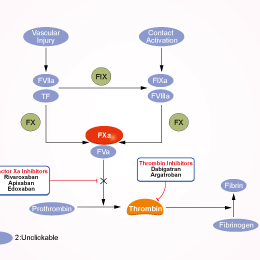 Biophen DiXaI, Biophen Direct Factor Xa Inhibitor; PT, prothrombin time; PT ratios, prothrombin time versus the normal pooled plasma (NPP); APTT, activated partial thromboplastin time; APTT ratios, activated partial thromboplastin time versus NPP. Br J Biomed Sci, 2016, 73(3):134-139.. Rivaroxaban purchased from Selleck. The activity of Rivaroxaban against purified serine proteases is measured using chromogenic or fluorogenic substrates in 96-well microtiter plates. The enzymes are incubated with Rivaroxaban or its solvent, dimethyl sulfoxide (DMSO), for 10 minutes. The reactions are initiated by the addition of the substrate, and the color or fluorescence is monitored continuously at 405 nm using a Spectra Rainbow Thermo Reader, or at 630/465 nm using a SPECTRAfluor plus, respectively, for 20 minutes. Enzymatic activity is analyzed in the following buffers (final concentrations): human FXa (0.5 nM), rabbit FXa (2 nM), rat FXa (10 nM), or urokinase (4 nM) in 50 mM Tris–HCl buffer pH 8.3, 150 mM NaCl, and 0.1% bovine serum albumin (BSA); Pefachrome FXa (50–800 μM) or chromozym U (250 μM) with thrombin (0.69 nM), trypsin (2.2 nM), or plasmin (3.2 nM) in 0.1 μM Tris–HCl, pH 8.0, and 20 mM CaCl2; chromozym TH (200 μM), chromozym plasmin (500 μM), or chromozym trypsin (500 μM) with FXIa (1 nM) or APC (10 nM) in 50mM phosphate buffer, pH 7.4, 150 mM NaCl; and S 2366 (150 or 500 μM) with FVIIa (1 nM) and tissue factor (3 nM) in 50 mM Tris–HCl buffer,pH 8.0, 100 mM NaCl, 5 mM CaCl2 and 0.3% BSA, H-D-Phe-Pro-Arg-6-amino-1-naphthalene-benzylsulfonamide-H2O (100 μM) and measured for 3 hours. The FIXaβ/FX assay, comprising FIXaβ (8.8 nM) and FX (9.5 nM) in 50 mM Tris–HCl buffer, pH 7.4, 100 mM NaCl, 5 mM CaCl2 and 0.1% BSA, is started by the addition of I-1100 (50 μM), and measured for 60 minutes. The inhibitory constant (Ki) against FXa is calculated according to the Cheng–Prusoff equation. The IC50 is the amount of inhibitor required to diminish the initial velocity of the control by 50%. Animal Models: Fasted, male Wistar rats (HsdCpb:WU) and fasted, female New Zealand White rabbits (Esd:NZW). Formulation: Rivaroxaban dissolves in polyethylene glycol/H2O/ glycerol (996 g/100 g/60 g) and is given by i.v. Rivaroxaban dissolved in solutol/ethanol/H2O [40%/10%/50% (v/v/v)] and is given by p.o. Dosages: ≤0.3 mg/kg for i.v. and ≤3 mg/kg for p.o. Administration: Administered via i.v. or p.o. Perzborn E, et al. J Thromb Haemost, 2005, 3(3), 514–521. Gnoth MJ, et al. J Pharmacol Exp Ther, 2011, 338(1), 372-380. Weinz C, et al. Xenobiotica, 2005, 35(9), 891-910. Apixaban is a highly selective, reversible inhibitor of Factor Xa with Ki of 0.08 nM and 0.17 nM in human and rabbit, respectively. 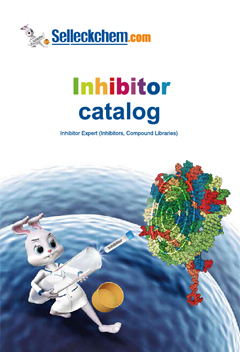 Features:A highly selective, reversible, and direct factor Xa inhibitor. Features:First clinical inhibitor of CK2. Methotrexate (MTX), analog of folic acid, is a nonspecific inhibitor of the dihydrofolate reductase(DHFR) of bacteria and cancerous cells as well as normal cells. It forms an inactive ternary complex with DHFR and NADPH. Daporinad (FK866, APO866) effectively inhibits nicotinamide phosphoribosyltransferase (NMPRTase) with IC50 of 0.09 nM in a cell-free assay. Phase 1/2.